Handwashing Using a Tippy Tap Conserves Water and They Are Easy to Build Too! 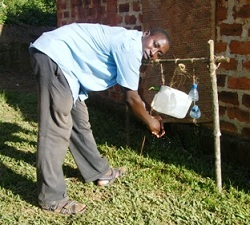 A tippy-tap is a simple handwashing device made of locally available material and very easy to build. It is really an ingenious solution to the problem of hygienic handwashing where there is no piped water. They are so simple to make that even children can do it. The materials consist of only an old plastic jug with a hollow handle, some string, a bar of soap, and maybe a piece of wood. The plastic jugs can be leftover from bleach, vegetable oil, bottled water, or just about anything, as long as it is well rinsed and cleaned out. Using a tippy-tap cuts down on the amount of water needed to wash your hands. We usually use way more water than what is necessary. But with the tippy-tap, you soon realize that you can wash your hands clean with about a tenth as much water. In the construction of the tippy-tap, the hollow handle of the jug is sealed off by melting it and pinching it closed. A small hole is punctured through the plastic handle just above the pinch. This is where the water comes out. Two other holes are punctured through the body of the bottle and a string is threaded through these holes to make a loop from which the tippy-tap is hung. A small plastic cap, tin can, or bottom of a small water bottle can be threaded onto the string followed by a piece of soap. 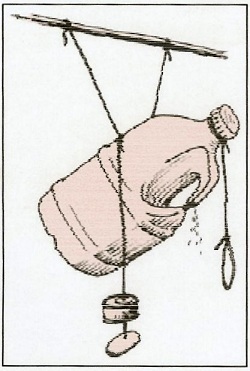 Another piece of string is tied to the neck of the bottle and hangs down with a loop tied on the free end. This string is used to tip the tippy-tap over so that water comes out of the small hole punctured in the handle. To use the tippy-tap, pull on the string loop with your thumb. Wash your hands in the water that comes out of the hole in the handle and using the soap that is hanging on the other string. Rinse off the soap with water from the tippy-tap. Dry your hands with a clean cloth. There can be many variations of this design. For instance, instead of having a string with a thumb-loop at the end, extend this string to the ground and tie a piece of wood to the end of it. The tippy-tap can then be tipped using your foot on the piece of wood like a foot pedal. Where there is no piped water and especially where water is scarce, using a tippy-tap can provide for hygienic hand washing and water conservation. Instructions for building a tippy-tap can be found in this PDF file. Return to "Hygiene Education" from "Handwashing"